This makes an awesome snack, appetizer or side dish. It's just so easy to make and the flavors come together beautifully. Using the broiler instead of frying the eggplant cuts back on unnecessary fat and calories. Make sure you use Japanese eggplants because they simply rock. Eggplants are low in calories and contain a broad range of nutrients. With 2 grams of fiber per cup, they also are a great source of folate, potassium, manganese and vitamins K, C, B6, phosphorus, thiamine and copper to name a few. So grab some aubergines next time you're at the market! 1. Preheat broiler. After washing and cutting eggplants, pat dry and using a knife, make a cross-hatch pattern on the skin side. Brush eggplants with canola oil so that they are well coated. 2. In a separate bowl, create your yummy miso glaze by combining miso, mirin, sesame oil and rice vinegar. 3. Place eggplants skin side up onto a lightly greased sheet and broil for 4 minutes, flip and broil another 4 minutes. Brush with miso glaze and broil another 3 minutes. Remove from oven and garnish with sesame seeds. 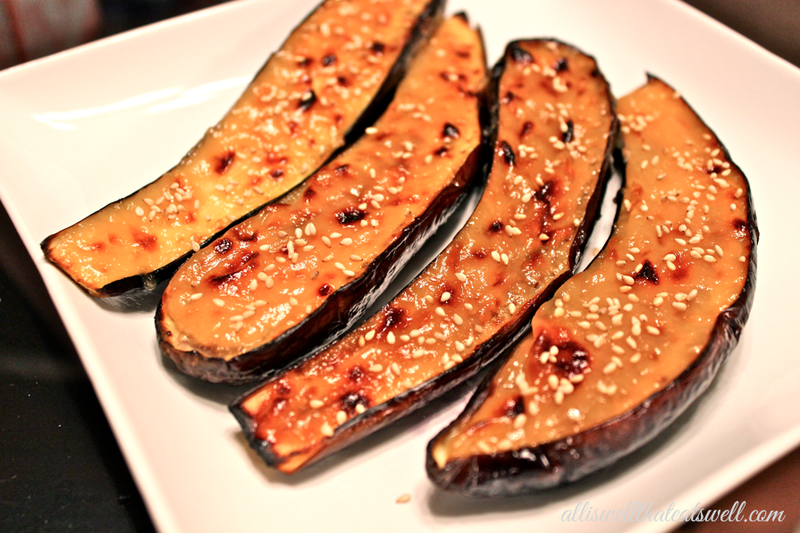 Once you dig into this dish you'll be saying "Miso" hungry for miso glazed eggplant too!